Antonio Banderas (The Mask of Zorro, Evita) brings huge star power to an immensely thrilling action-adventure from the hit-making director of Die Hard and The Thomas Crown Affair ! 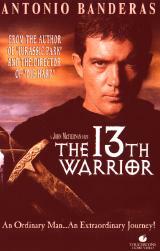 An exiled ambassador far from his homeland, Ahmed (Banderas) comes across a fierce band of warriors who are being attacked by ferocious creatures legendary for devouring all living things in their path! And when an old fortune teller warns the combatants that they are doomed to failure without a 13th warrior, Ahmed is given no choice but to join their battle and help conquer the mysterious enemy! Suspenseful and endlessly exciting, this exhilirating hit is sure to thrill anyone who enjoys action on an epic scale!